Canada Post may not deliver your registration form to us in time. We are prepared to take your advanced registration at the school. Friday, May 14 – Old Arena at Hwy#7 and Main Street, upstairs, 6pm to 9pm. 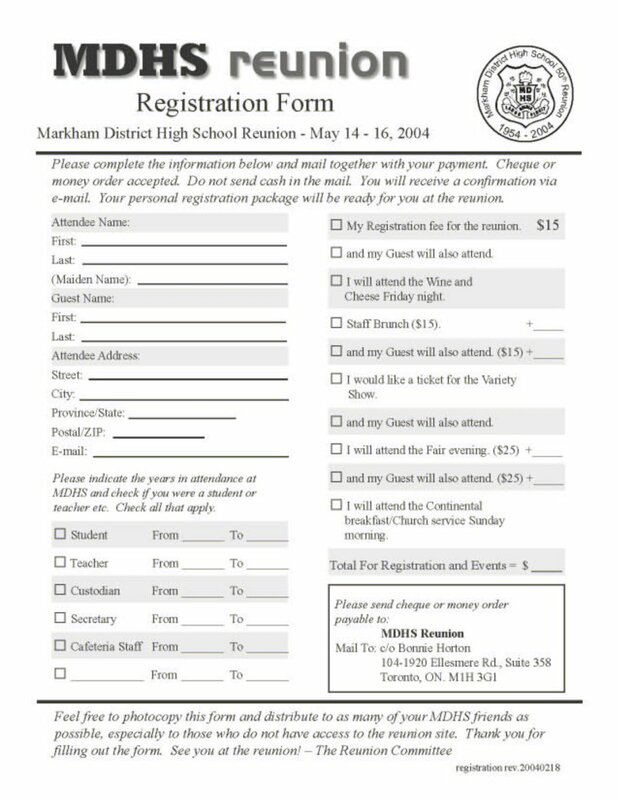 If you have already sent your registration form by mail, you may pick up your registration kit on Saturday at the school on Church Steet in the East Foyer. If you are attending the Saturday evening festivities only, you may pick up your kit at the Fair Grounds. You will need the Adobe Acrobat Reader plug-in to view this document. Print out this form, complete the information and mail together with your payment. 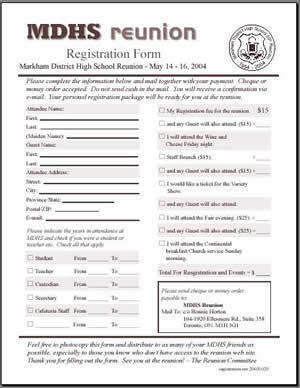 Now that the MDHS Reunion Registration Form is in circulation and on the website, you might be wondering why the need to pre-register. Certainly you could just arrive in Markham the weekend of May 14 - 16, 2004, register and be part of the fun to a certain extent, but to really take advantage of all that has been planned, you should pre-register. First of all, your committee needs to know numbers so that we can be sure we have booked the right amount of space, ordered enough muffins, provided enough parking, etc. We want this to be the most convenient and best possible time for you, and to do so we need to know numbers. Secondly, there are events for which there are a limited number of tickets. Registering early means that you stand a better chance of reserving the hottest tickets in town in your name. And finally, you may have some great ideas to pass along to us when you register that could enhance the weekend for everyone. If we know soon enough, we may be able to incorporate those ideas into the weekend's events. Don't delay! Download your registration form today, and send form along with the registration fee and payment for any other events you wish to attend to the address listed on the form. Refund Policy: In some cases, it will be necessary for people who have registered to change their plans. If they have paid but are now unable to attend, a refund will be issued. Note: Refund requests must be confirmed by e-mail or phone by Friday May 14. You must have confirmation by the Reunion Committee by May 14, 2004. One last note: registering on the Member's Forum on the website is not the same as registering for the reunion weekend. You MUST send in by mail, the registration form with payment to attend the May 2004 events. If the Abcrobat document just isn't working for you, click this low-resolution image link which should open in your web browser. Print it from your web browser.